Home » Politics & Public Affairs » What do Canadians think of Newfoundland and Labrador? Quebecers least likely to view Newfoundland and Labrador positively. Nationally, over six in ten Canadians surveyed (62%) said they had a very or somewhat favourable impression of Newfoundland and Labrador. One in three (34%) said they had a neutral impression while 4% said they had an unfavourable impression of the province. Impressions were fairly consistent across Canada with Atlantic Canadians being most likely to have a very favourable impression (55%) and Quebec residents being least likely to have a favourable impression (38%). 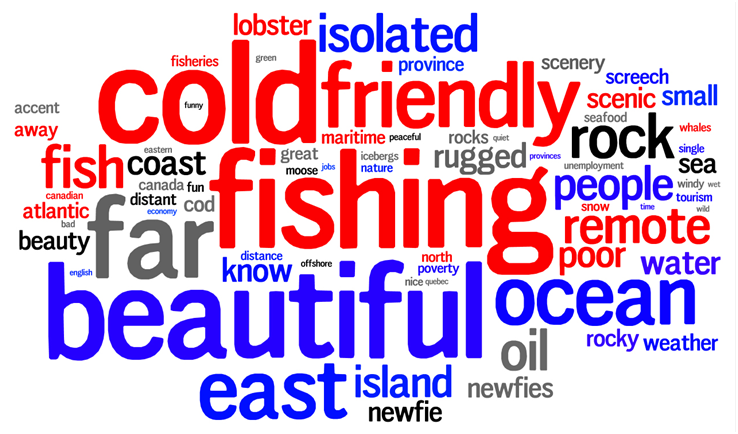 When asked to write out three words that first come to mind when they think about Newfoundland and Labrador the most frequently mentioned words focused on the province’s geography and climate (words like beautiful, cold, ocean, island, and far) while others mentioned the province’s maritime economy (fishing, fisheries, and lobster). A number of respondents mentioned the province’s oil reserves. Negative words included “remote”, “unemployment”, “isolated”. The word cloud below displays the results of the question with larger words being mentioned more frequently than smaller words. Respondents were also shown a series of statements and were asked how well each statement applies to the province. Overall, half of respondents believed that Newfoundland and Labrador is “a nice place to live and raise a family. There was less consensus when it came to Newfoundland and Labrador being an energy superpower (27% very well or somewhat well), a rising star in Canada (36%), and a great place to do business (26%). The good news for the province’s brand is that only 31% considered the Newfoundland and Labrador a “have-not province”. Overall, many Canadians were unsure about their opinions of the province. A large percentage were unsure about how well the statements applied to the province indicating that the province remains an unknown quantity for many Canadians. A large percentage of Canadians (45%) did believe that the province has great television ads promoting the province. Only 28% believed that the statement did not apply well to the province. Canadians by and large view Newfoundland and Labrador positively. Most do not view the province as a have-not province but many still associate it with its fishing heritage. The province is viewed as being beautiful and rugged but also remote, cold, and isolated. Most Canadians do not see the province as a great place to do business but a majority consider it a nice place to raise a family due in large part to the idea that Newfoundlanders and Labradoreans are friendly and welcoming people. On May 15 and 16, 2012, Abacus Data Inc. conducted an online survey among 995 randomly selected Canadian adults living outside of Newfoundland and Labrador from an online panel of over 150,000 Canadians. Since the online survey was not a random, probability-based sample, a margin of error could not be calculated. The margin of error for a survey of 995 respondents using a probability sample is +/- 3.1%, 19 times out of 20. When you first think of Newfoundland and Labrador, what three words first come to mind? *The larger the word, the more frequently it was mentioned.